The robot has two controlled active wheels and two passive ones. The onboarded sensorization system is known and based on laser technology. The route includes three obstacles, two with identical rectangular section O1 and O2 that will be skirted by the robot, and an A0 arc through which the robot must pass. In addition to the mentioned fix obstacles, there are four corners delimiting the test area as reference elements. The identification of objects must be done according to their known size. In the work area there is another robot smaller (see figure 2), also provided by ASTI, making a predefined route T0 continuously at a predefined constant speed around the arc A0. The robot controlled by the competitor must maneuver to always maintain a safe distance from the intruder robot. The incorporation of technological novelties as well as obstacle detection and maneuverability algorithms of industrial robots is a known challenge in the IROS community. The main interest of this new competition is the adaptation and interaction of competitors with an industrial robot to complete an obstacle race without global positioning systems. 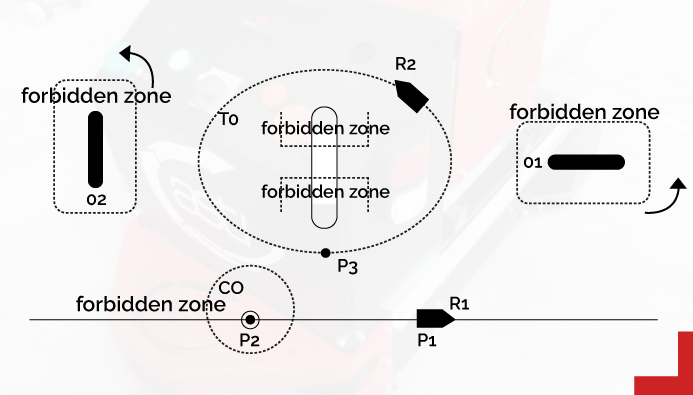 Competitors must use an Easybot provided by the ASTI company (see figure 1). Robot R1 actuated by the competitor through a CAN interface. Also, he/she will have access to the pointclouds provided by the LIDAR placed in the front of R1. Robot R2 to be avoided. Two obstacles, O1 and O2 with rectangular section (2mx0.5m) and height 1m. An A0 arc with free zone 3m wide and 2m high. A cylinder C0 of 0.5m diameter and 1 meter high at arrival point. Four corners of 1mx1m and 90⁰ delimiting the test area. Phase I (deadline 15 June 2018) In this phase the teams will send a video with the simulation of a robot like the real, executing the tasks of the competition and optionally a technical note with the description of the solution. The recommended simulation platforms are based on either ROS or Matlab, but any other simulator platform can be used if it is preferred. In addition, the teams will be able to attach the source code and whatever source files to demonstrate that the simulated robot can accomplish the mission if it is considered necessary, this point is optional. The teams able to demonstrate by simulation the completion of the required tasks will be able to participate in the phase II. The performance of the robot will not be neither quantified nor valued in the phase I to advance to the phase II. The phase I is only required to check that the teams have a minimum reasonable control strategy to be able to work with a real robot. A technical note describing the simplified robot’s geometry will be given to the teams when they join the challenge. The robot will use a lidar LMS100, this model is available in ROS libraries. 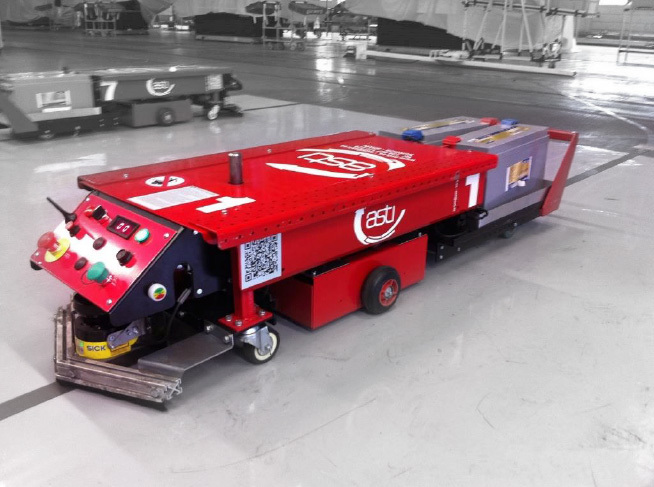 In this phase the teams will be able to test and calibrate their hardware in the industrial mobile robot, as well as physically execute the challenge. The teams will have to send previously a short paper (maximum 4 pages) and a poster describing the technical solution. The posters will be exhibited during the competition. This competition will be supported by the ASTI Foundation (www.asti.es ). All participants will receive the “IROS2018 ASTI-UAH Industrial Robot Obstacle Race Competition” participation diploma. The winner of the phase II competition will receive a monetary award. Additional sponsors will be sought to support the challenge. A free rectangle space of 22×8 meters will be needed. A free height of 2 meters will be enough. The obstacles will be provided by ASTI and UAH. CV: Jesús Enrique Sierra Garcia (male) has degrees in Electronics Engineering, Telecommunications Engineering, Control Engineering and one MBA. His professional experience includes more than 10 years working as researcher and software & hardware engineer in several companies like Telefonica R&D, MLS, Digital Training, Coritel, RYME and the Spanish Research Council. In 2013 he decided to join ASTI’s team to be part of the research and development department. Where he is currently the head of Technology Development Team. This team is exploring, and integrating new technologies to improve the platform of intra‐logistics solutions. In parallel he is building his academic career as lecturer in the University of Burgos in the area of Languages and Computer Systems. His research interest includes robotics, modelling, intelligent control and soft computing techniques. He belongs to the organization committee of the ASTI Robotics Challenge, a competition to promote the development of STEM talent and the research on mobile robotics. In the edition of 2017 this competition attracted a wide media attention and more than 20 teams from different points of Spain. CV: Felipe Espinosa received the M.S. degree from the Polytechnic University of Madrid, Spain, and the Ph.D. degree from the University of Alcala (UAH), in Telecommunication, in 1991 and 1999 respectively. He became a Full Professor in 2016 in the Electronics Department with the UAH, regularly involved in electronic control and automation subjects in several Post-Degree programmes. His current research interests include network control systems, event-based control, wireless network systems and sensorial integration applied to intelligent transportation systems and intelligent environments. He co-organized the Track 4 (Indoor Mobile Robot Positioning) at the International Conference on Indoor Positioning and Indoor Navigation 2016. Canbus interface (db9 female connector, pin2: CanLow, pin3: gnd, pin7: CanHigh). The communication protocol will be published in an additional technical note.